Ok, so I may have gone a little crazy... I ordered a whole Benton's Country Ham after watching David Chang and Sean Brock rave about it on Mind of a Chef (my current TV obsession). 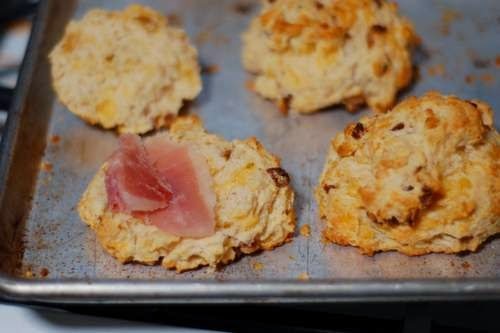 These biscuits are a delightful blend of savory and sweet, the perfect vehicle for a paper-thin slice of country ham. And no refined sugar, just dates! Whisk together the flour, baking powder, and salt. Cut in the shortening with a pastry cutter or a fork, or two knives. Or use my new favorite technique - just squish it lightly with your fingers, a sort of sifting motion. The goal is to have the mixture resemble coarse cornmeal mixed with plenty of bigger flour-coated bits of shortening. For me, this has always been the most frustrating part of biscuits and pie crust, and the reason I don't usually bother making my own pie crust. Another great way to accomplish this step is to grate frozen butter into the flour mixture and then just stir it in with a fork. Add the milk, cheese, and dates, and stir until the dough pulls away from the sides of the bowl. Drop handfuls onto a baking sheet and pop into the oven for 20 minutes or until the edges are lightly browned. Serve with country ham, or eggs, or just slather with butter and enjoy!